The yeti is a mythical creature who is supposed to live in the Himalayas, the highest mountain range in the world. In Tibetan the word means "magical creature". Alternatively: "The Western name is derived from the Tibetan yeh-teh (transliterated: gYa' dred), "little man-like animal". Some Tibetan locals call a Yeti like creature a Kanchenjunga demon. A team of mountaineers travelled to the region on a reconnaissance mission before attempting to conquer Everest for the first time, a feat achieved two years later. Eric Shipton recorded the footprint, and Tom Bourdillon, passing on the evidence to his friend Michael Davies, wrote: "Dear Mick, Here are the footprint photos: sorry for the delay. We came across them on a high pass on the Nepal-Tibet watershed during the 1951 Everest expedition. "They seemed to have come over a secondary pass at about 19,500 ft, down to 19,000 ft where we first saw them, and then went on down the glacier. "We followed them for the better part of a mile. "What it is, I don't know, but I am quite clear that it is no animal known to live in the Himalaya, & that it is big. "Compare the depths to which it & Mike Ward (no featherweight) have broken into the snow. Yours, Tom Bourdillon." Are the Yetis of Extraterestrial Origin? Yetis could be of alien origin. Their home planet might be much colder than the Earth so they have physical bodies adapted for the extreme cold of the higher himalayan regions. Perhaps they crash landed hundreds of years ago and live in secret in mountain caves. Are the Yetis Spiritual Adepts? Advanced spiritual adepts may have extraudinary powers. They can survive in extreme temperatures and can take on different appearances. Their physical form may actually mutute by an act of will and they can live for hundreds of years or more if they decide to. High mountainous and inaccesscable places are sometimes chosen as living places by the Spiritual Masters. Mountain regions are said to be holy and have a pure atmosphere. Are the Yetis Programmed Thoughtforms? Yetis may be thought creations used as servitors/golems/servants by meditating Spiritual Adepts. The Spiritual Adept would be sitting in a concealed cave and occasionally sending out the Yeti thought creation to perform various tasks such as gathering food/recources or interacting with the environment. Perhaps they are are used to direct people away from the hidden caves either by fear or curiosity. Yetis could be ghosts from a long past civilization or a group of advanced primates-humanitiy's ancestors. Are the Yetis Remnants of a Primitive Race? 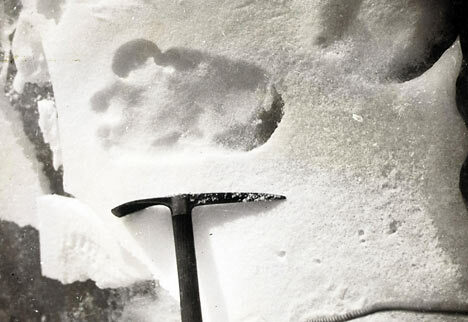 Yetis could be part of a small remaining tribe of ancient humans or-pre-humans. There maybe a vast network of undiscovered caves in the himalayas that helps them survive and remain concealed. They may be more telepathic than most present day humans and have other powers as well. Are the Yetis Remnants of an Advanced Race? The Yetis could be an advanced race with access to advanced technology from a past Golden Age.